Irish Diplomacy - The ability to tell a man to go to hell so that he will look forward to the trip. St. Patrick's Day Annual Luncheon, Friday, March 15, 2019, Le Centre Sheraton. ​For those of you who are interested, there will be a meeting on Thursday, January 17, 2019 at 7:15pm in St. Gabriel’s Church Hall, 2157 Centre Street, Montreal for an update from the Black Rock Irish Memorial Committee. 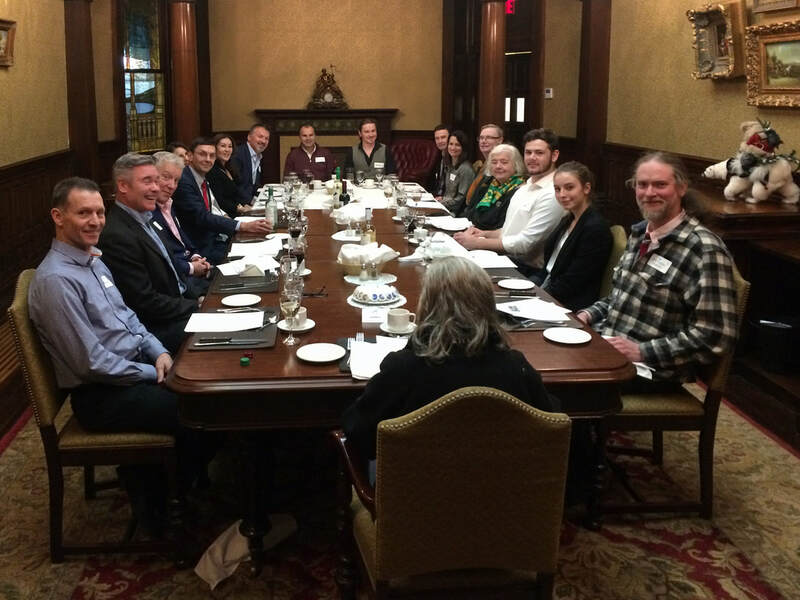 Over many months, the committee, comprised of Victor Boyle, Fergus Keyes, Scott Phelan, Lynn Doyle and Paul Loftus, has had a series of meetings and workshops with Hydro Quebec and the City of Montreal. The committee members report that the project is now at a stage where they can share their progress and excitement with the Irish Community. There will be a formal presentation followed by a question period. Please share this invitation with all those who may be interested. The committee members look forward to seeing you there and sharing their information. Newly elected IPBS President, Robert Ouellette & David Clendenning, Secretary-Investment Manager. IPBS Rev. Jim McDermott giving the Prayer. 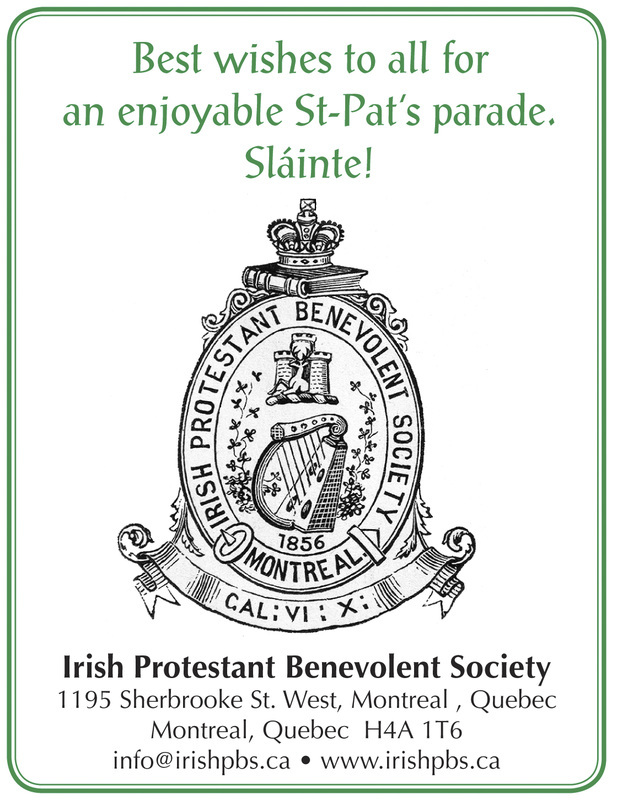 The United Irish Societies of Montreal was founded in 1928 and has organized the annual St. Patrick’s Parade since the 1929 edition, being active and visible in the community for 90 years! This is a milestone we should all be proud of. To celebrate this great achievement there will a gathering on Friday, October 26th at Buffet Il Gabbiano in LaSalle. 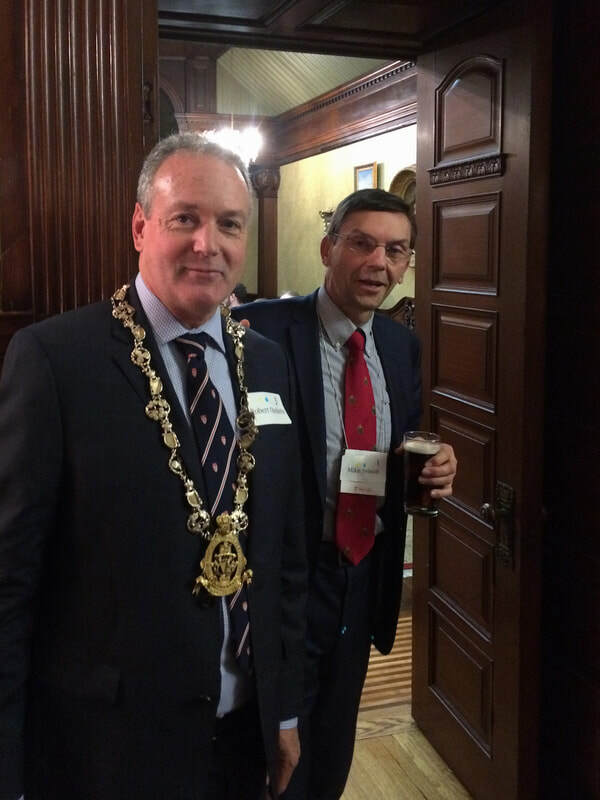 Lord Mayor of Dublin's Visit to Montreal to participate in the Annual Walk to the Stone on May 27th, 2018. For more information about the itinerary and fees associated with this event, please consult the enclosed program, registration form and support documents. Participants may pick and choose what they wish to attend, or they can attend everything. All we ask is that you register and return your completed form with payment to QAHN as soon as possible. As space is limited, you should register early. Please note that QAHN has booked a block of rooms for both Friday and Saturday evenings, and at very competitive rates, at the Hôtel l'Oiselière in Lévis. Again, we suggest you book early as space is limited! Letter from St. Patrick's Society of Montreal to the Irish Protestant Society of Montreal on the McGee memorial celetration. Announcement of new Embassy of Ireland Consulate in Vancouver, December 11, 2017. ​The Griffintown Tour & Guidebook by film director G. Scott MacLeod. 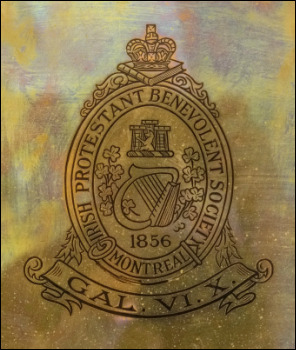 The Irish Protestant Benevolent Society (IPBS) commends the Embassy of Ireland for its work in assembling the historical contributions of the Irish to Canada for the exhibition. The IPBS was pleased to have made a contribution to this worthwhile endeavour. In this landmark year for Canada, the Embassy of Ireland is proud to present an exhibition celebrating the strong and deep bonds of friendship that Ireland and Canada have long enjoyed,as part of the National Capital Commission’s series of Confederation Pavilions. We are delighted to commemorate the important, positive contribution that the Irish in Canada have made to the fabric of Canadian life as we know it today, through the stories of Irish personalities from the time of early European settlement onward. Visitors will explore the history and vibrancy of the Irish community in Canada from the Atlantic to the Pacific, and from the southern border to the Arctic. These stories tell about Irish people who provided labour for the physical infrastructure of Canada’s canals, railways and roads, and who were also central to the creation and development of Canada’s political and civic institutions, through their involvement in law, politics, journalism, literature, religion, trade, the military and exploration. 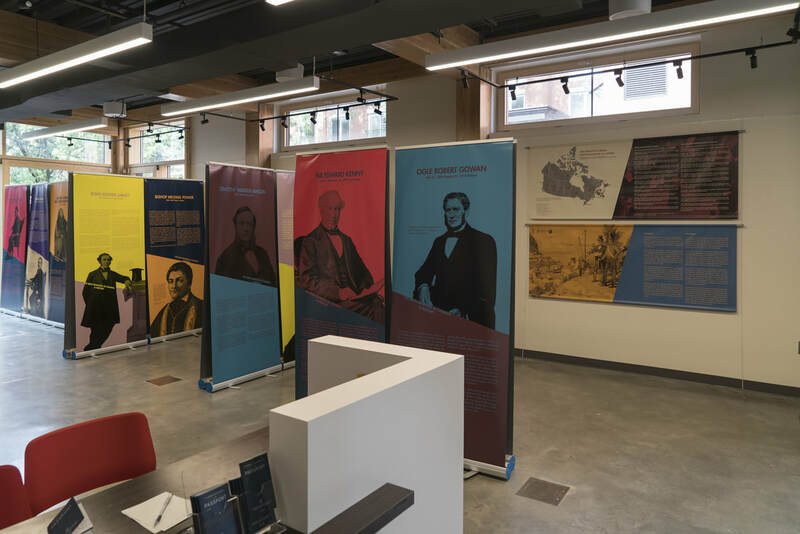 To celebrate 150 years of Confederation, the National Capital Commission identified some of the Capital’s most distinctive, but underused buildings, and set out to find inspired partners to breathe life back into them. 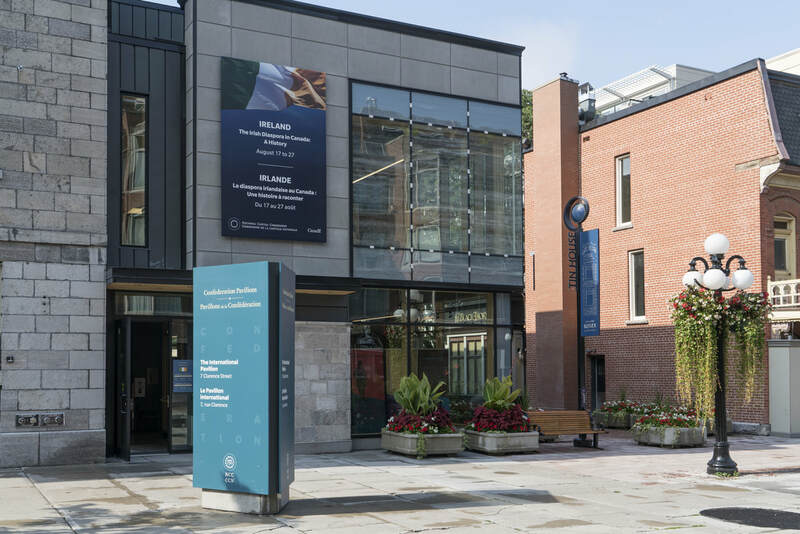 The International Pavilion at 7 Clarence Street is a contemporary building that is part of a much larger restoration project in and around the Tin House Court in the ByWard Market. Today, it hosts diplomatic missions that exhibit and promote the best of their culture, commerce, ideas, values and traditions. International Pavilion, 7 Clarence Street, Ottawa. Gallery Display Area, 1st Floor. List of Contributors to the Irish Diaspora Exhibit. 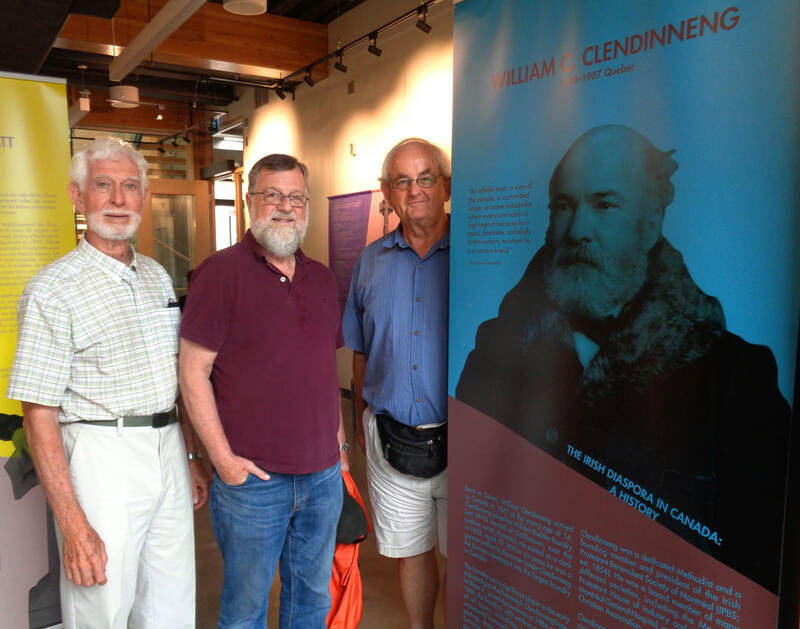 IPPS Council members, Bill Kilfoyle, Jim McDermott and David Clendenning visits the Irish Exhibit on August, 22, 2017. AOH Annual Pilgrimage to Grosse Ile and the Irish Memorial. - Saturday, August 19, 2017. Monday August 14, 2017, at 4:30 P.M.
Federation of Irish Societies (FIS) Annual Summer Party, June 27th, 2017. The IPBS's Annual Dinner at the Old Brewery mission was extremely worthwhile. Our crew was there on Wednesday evening to serve dinners to over 600 needly people. The Old Brewery Mission is founded in 1889 to help feed the working poor and destitute of Montreal. Dinner at Old Brewery Mission, May 24, 2017. Mike Nelson, IPBS President; Jean, Manager of OBM; David Clendenning, IPBS Secretary; Robert Quelette, IPBS Vice President. Following on my recent announcement, I am pleased to confirm a joint lunch with Prime Minister Justin Trudeau and Irish Taoiseach Enda Kenny on Thursday, May 4. The Montreal Chamber of Commerce through their Bell International Leaders series is hosting the lunch. Further information on individual tickets and tables is available on the link below. This once-in-a-lifetime event is a great honour for the Montreal Irish community and, since Taoiseach Enda Kenny will be attending a similar event in Toronto, it is important that we support this visit in large numbers. Given the unique historical nature of this visit, as well as the short time available to us, I am urging individuals to consider attending this event. I hope to see a large attendance at this historic moment for Montreal’s Irish Community. Individuals can attend at the ‘membership price’ of $125 but I stress that people need to act right away so that numbers can be finalized. 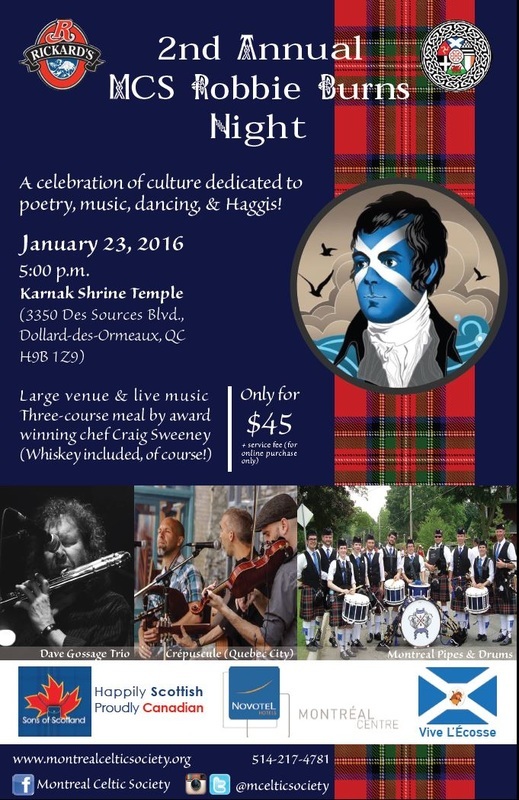 If you would like several tickets at this lower price, please contact Marion Mulvenna at Irish Studies (marion.mulvenna@concordia.ca). But you will need to do so as soon as possible. 2017 EUROPE DAY - INVITATION Montreal, Tuesday, May 16, 2017, 4:00 PM - 7:00 PM, BLG Offices, 1000 De La Gauchetiere Street West, Montreal. Registration by May 10, 2007. Annual Walk to the Stone, Sunday, May 28, 2017. Start at 10:30 am; St. Gabriel's Church, 2157 Centre Street, Montreal. We return on the 31st of March with our always popular Evening of Irish Short Films, programmed by Heather Macdougall and Kester Dyer – and we’re be back to our regular Friday slot with nine short films, lovingly selected by our two Short Film programmers. Heather and Kester have worked long and hard on this program and there’s lots to read – and see – at the www.cinegaelmontreal.com website, with descriptions, stills, and trailers to watch. So, visit and start to prepare yourself for the voting for Audience Favourite on Friday evening. Cross Community Get Together - To Honour the Visit to Montreal of Minister Pat Green, Irish Minister for Employment and Small Business, Government of Ireland and Kevin Vickers, Canadian Ambassador of Ireland, Irish Embassy Pub, 1234 Bishop Street, Montreal, Tuesday, April 4, 2017, 5:30 p.m. The Irish Embassy in Ottawa advises that the new online passport renewal service for adult applicants, to be launched tomorrow Thursday 30 March, 2017. · Your Passport Book must have less than 12 month’s validity remaining on it. This does not apply for applications due to lost, stolen or damaged passports books. Any queries regarding the new service can be emailed via this link or by calling Tel: (+353) 1 6711633. Montréal’s St Patrick’s Parade is famous the world over and widely considered one of the best. It is the highlight of the Irish Festival with all of Montréal’s Irish organizations taking part. The first parade was held in 1824 and has transformed into an event that all Montréaler’s look forward to regardless of their background. It uniquely celebrates not only all things Irish but all the communities that make up Montréal. After a sometimes very long winter it signals to all that spring has finally come. Each year over 100 hundred different groups composing of thousands of people take part in the parade that up to 750,000 people gather to watch. This year to mark Montréal’s 375th anniversary the organizing committee has planned some fun new items to highlight the people and history of the city. St Patrick's Day Annual Luncheon, Friday, March 17, 2017, 12:00 noon, Plaza Centre Ville-EVO 777 Robert Bourassa (University), Montreal. See attachment for details to join the Ireland-Canada Chamber of Commerce (ICCC) Table. The Annual Mass of Anticipation will be celebrated at St. Gabriel’s Parish, 2157 Centre Street Montreal, on Sunday, March 12, 2017 at 11:30 A.M.
Saturday, March 11, 2017, 9:00 a.m.
777 Robert Bourassa (formerly University) Blvd. 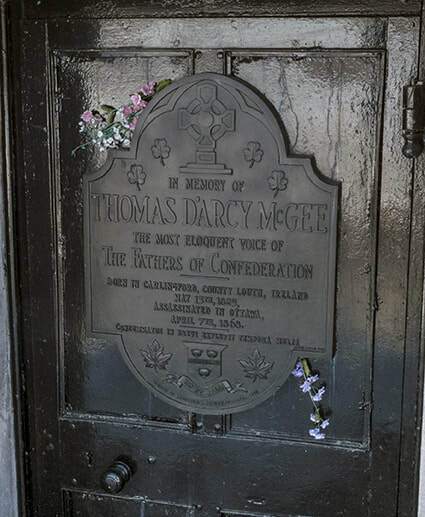 Info: This paper explores gendered experiences of Irish and Scottish male settlers in Upper Canada during the first half of the nineteenth century. The image of aggressive and wild Celtic races settling in the British colony applied at times to both Protestants and Catholics during the period before 1850, making each denomination and ethnicity an object for possible scorn and rejection by the colonial establishment unless they could prove their loyalty to the imperial framework. This paper will examine three men -- Ogle R. Gowan, founder of the Orange Order in British America, Alexander Macdonell, the Bishop of Kingston and defender of Scottish Catholics and Highlanders in Upper Canada, and Peter Aylen, the nefarious leader of the Irish Catholic Shiner gang on the Ottawa River -- in order to explore the various negotiations Irish and Scottish men in Upper Canada had to make time and again with notions of manliness, loyalty, kinship, ethnic and religious discrimination, and the constant pressure from the establishment to be more 'British'. Obituary of Robert Faith, a long time member of the IPBS, Council member and President (1993-5). 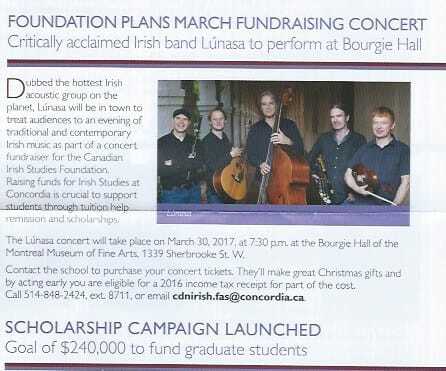 The Lúnasa concert will take place on March 30th at 7:30 pm in the glorious and acoustically perfect Bourgie Hall of the Montreal Museum of Fine Arts, 1339 Sherbrooke St. W. Ticket price is $75. You will be issued with a 2017 tax receipt for a portion of the cost. 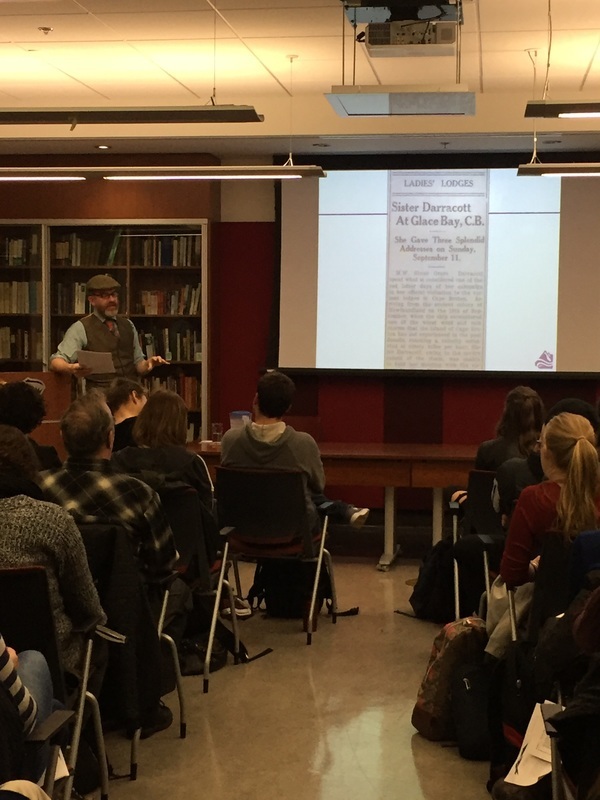 CAIS conferences are wide-ranging interdisciplinary events which provide an exciting meeting place for scholars, artists, writers, and performers. In 2017 the conference is coming to the historic plantation city of Derry in Northern Ireland. A major Atlantic Port, Derry was the point of embarkation for many thousands of Irish emigrants heading to colonial North America before the 19th century. Yet it retained strong Canadian connections after that. The organizers are seeking papers covering from any aspect of any discipline within Irish Studies are sought. 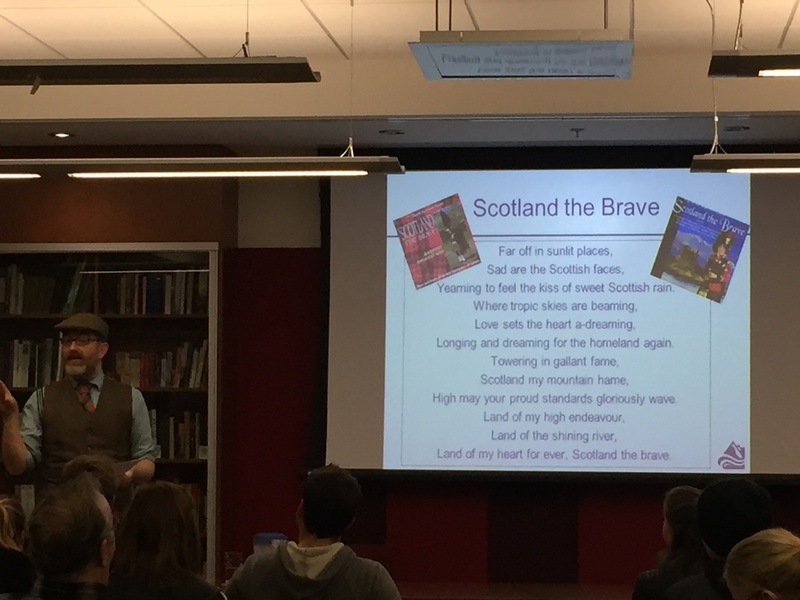 They also hope to have a strand which expressly addresses the interconnections between Canada and Ulster, whether historical, literary, artistic or performative. The organizers encourage papers in English, French and Irish, supported by a booklet of abstracts that will be in English. Please send, by 20 January 2017, proposals for individual papers or panels (three papers plus chair) to CAISDerry2017@gmail.com. Proposals should include: title, 250-word abstract for each paper submitted, and correspondence details, including an email address. Professor Donald Harman Akenson, Queen’s University, Canada. Professor Danine Farquarson, Memorial University, Canada. Professor Margaret Kelleher, University College Dublin. Professor Máirín Nic Eoin, Dublin City University. The "Irish Season" is already here. Please join the Irish Community at the event below. The details are on the flyer. It is always an enjoyable evening. If the IPBS does not have its own table please joino the FIS Table. Please confim your attendence as soon as possible and make your cheque payable to The United Irish Societis, Montrel. Please mail to: Paul Loftus, Chairman, The Federation of Irish Societies, 350 Prince Arthur Street, West, Suite 1811, Montreal H2X 3R4. 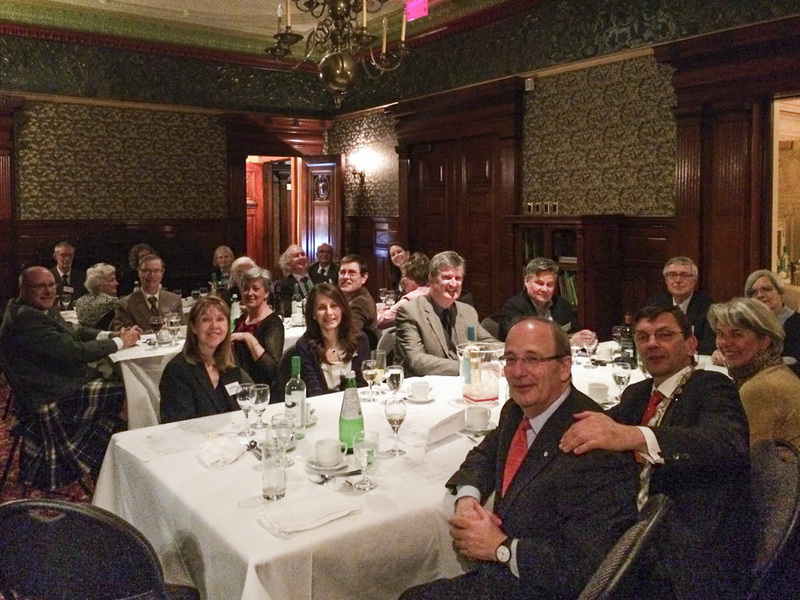 The IPBS Christmas Luncheon was held in Montreal, on Friday, December 16, 2016, at the 3 Brasseurs Crescent Restaurant and was well attended and enjoyed by all. L. to R.: Amy Loftus, David Clendenning, Chad Spannaus, Robert Quelette and Mike Nelson. What: To celebrate its quarter-century, Ireland-Canada Chamber of Commerce invites members and friends to join them for a night of Christmas cheer, drinks and Irish culture. This year’s reception marries novelties such as a Québec-Irish food station with ICCC traditions such as complimentary drinks, live music, and great door prizes, with an opportunity to mingle with friends, new associates and a distinguished array of Irish-Canadian guests. November 17, 2006 from 5:30 to 7:00 pm. 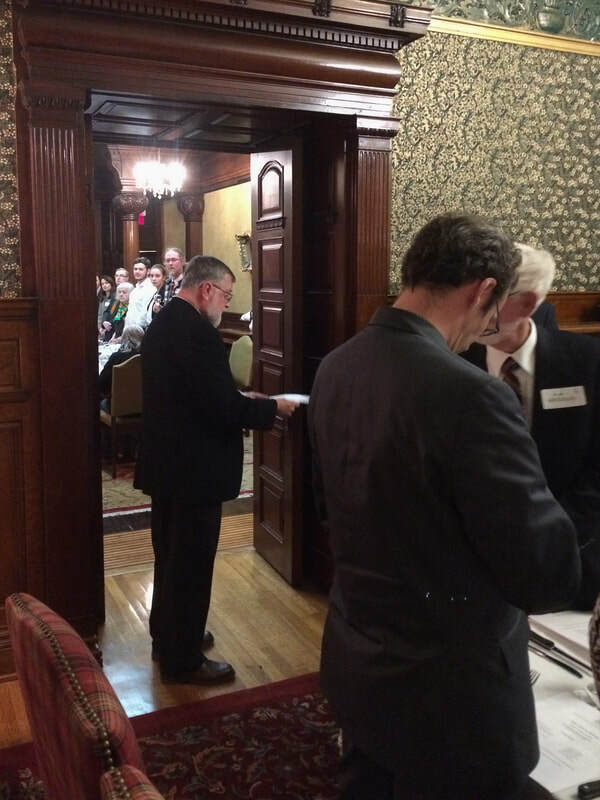 What: 9th Annual Irish Protestant Benevolent Society Lecture by Donald McRaild. Info: Prior to the emergence of modern social welfare provision, a variety of institutions, approaches and strategies were available to support the poor, hard-pressed, or unfortunate. In settler societies such as the US and the British colonies, huge waves of emigration, the limited means of many arrivals, and the rapid preponderance of urban growth and settlement, made the creation of support structures vital. Charitable provision by the churches, associations, clubs, and other organizations provided vital safety nets for the poorest members of society. Doctors, nurses, hospitals, burial plots, warm food and shelter, and Christmas cheer, all were sought after and appreciated. However, hand-outs from elites did not sit well with all members of society. Many independently-minded folk fought hard to erect structures of mutual support: systems of benevolence based on regular payments into shared funds. Trades’ unions, friendly societies, and a panoply of ethnic societies provided this type of support—a type that marked a very deliberate desire to avoid charity and the stigma and moralizing that went with it. This lecture provides a wide-ranging overview of the ethnic dimension of benevolent mutualism, exploring in particularly how ethnically Irish and British organizations were developed to provide their own safety net for when the fit and healthy sought felt their luck turned, or as time passed. Drawing upon evidence from the English-speaking world more widely, argues that, even in the sphere of mutualism and collective self-help, sectarian filters were applied to the idea of confraternal togetherness, so that Irishmen looked after Irishmen, Britons looked after their own, and the tenets of class often were stifled by the imperatives of nation or church. Donald MacRaild is Professor of British and Irish History at Ulster University having previously held chairs of History at the Northumbria University and Victoria University of Wellington, New Zealand. Prior to that, he held lectureships at the universities of Northumbria and Sunderland. He is a leading authority on the Irish Diaspora and has produced ten books or pamphlets and over forty articles and chapters. Professor MacRaild is member of the Arts and Humanities Research Council Peer Review College, a member of the Inner Panel of the Irish Research Council and an assessor for the Australian Research Council. He has held major funding from Leverhulme, the ESRC and the AHRC, and has had smaller awards from the Scouloudi Foundation, the Marc Fitch Fund, and others. 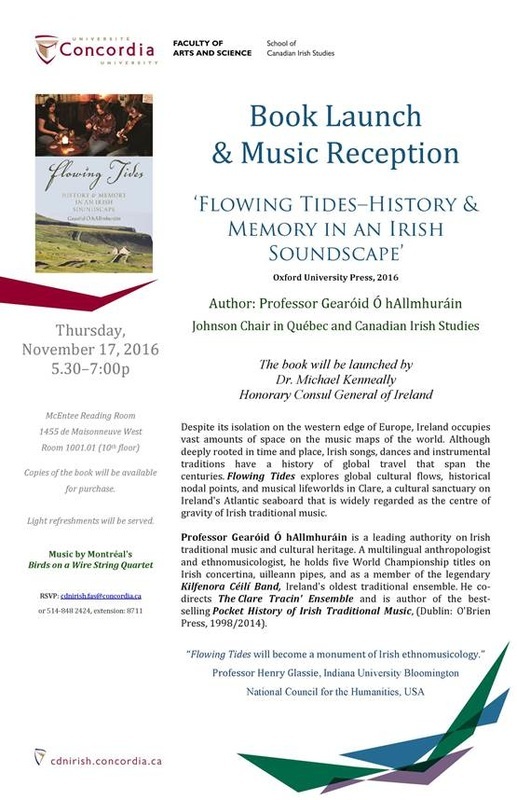 What: The School of Irish Studies is proud to launch the publication of Flowing Tides – History and Memory in an Irish Soundscape by Professor Gearóid Ó hAllmhuráin, Johnson Chair in Québec and Canadian Irish Studies. Info: Light refreshments will be served. Books will be available for purchase. Music by Montreal’s Birds on a Wire String Quartet RSVP cdnirish.fas@concordia.ca or 514 848 2424 x 8711.
where no ships and no passengers were refused. Black Rock on Bridge Street. Ancient Order of Hibernians unveiled the 46 foot Celtic Cross. to create a lasting memorial at the site of the Black Rock. Return: Saturday, August 20, 2016 at 9:00 P.M. Luxury Coach to Berthier sur MerLeisurely Boat passage along the St. Cemetery to remember those lost. Please – join us on August 20, 2016. All are welcome. Room is available. Bring your heart and your imagination". To receive a copy by mail, please contact Matina at cdnirish.fas@concordia.ca or 514 848 2424 c8711. 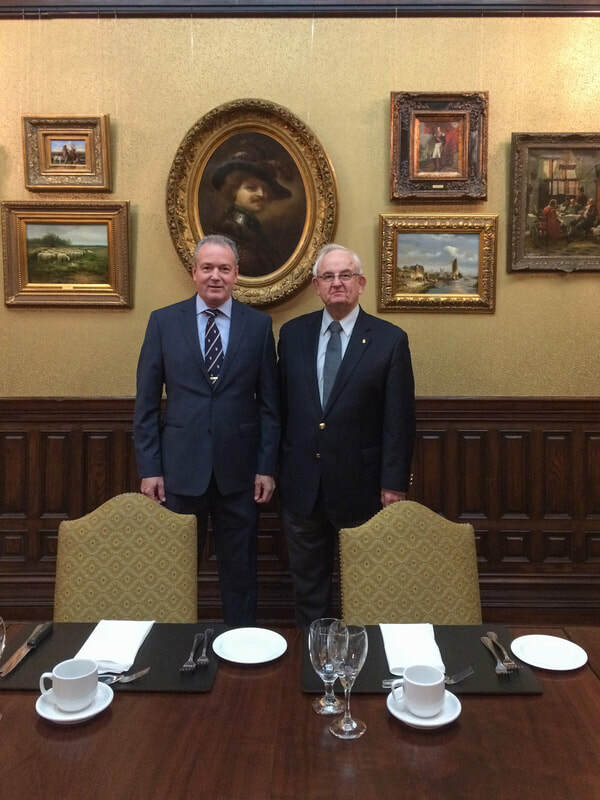 Farewell Dinner for the Irish Ambassador, Wednesday, June 29, Atwater Club, 3505 Avenue Atwater, Montreal. 6:30 PM. Some of you did not receive this message the first time, so I am sending it again. My apologies for duplications. Please circulate to your members and to those who may be interested. I am pleased to inform you that a farewell dinner will be held for Ambassador Ray Bassett and his wife, Patricia, to thank them for their extraordinary commitment to, and support of, our community during their six years in Ottawa. 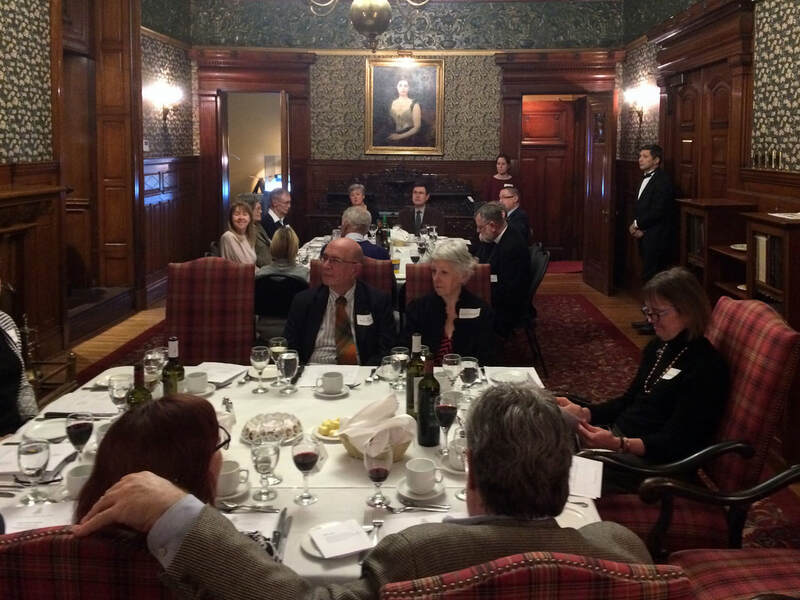 The dinner will take place on Wednesday, June 29 (the date had to be re-scheduled because of Ambassador Bassett’s schedule) at the Atwater Club, 3505 Avenue Atwater, just north of Sherbrooke (514 935 2431), and is open to all members of the Irish community and their partners. Tickets will be arranged on an individual basis but Irish associations are invited to arrange seating together for their members. Cocktails will begin at 6.30pm (cash bar) with dinner planned for 7.15pm. Tickets are $65 (fish or beef) or $60 (chicken) inclusive of all taxes and cost of dinner for the Bassetts. Wine is extra. Because the Atwater Club requires one payment, cheques should be made out to “Michael Kenneally” and I will pay the Club. I expect space to be limited so I encourage you to make reservations early. Space will be allocated strictly on a first come first served basis. Reservations will not be confirmed without payment. Mail your cheques to me at the address below, and indicate your choice of menu and whether or not you will be sitting with an association. If you have queries, you can email: cdnirish.fas@concordia.ca or phone 514 848 2424, ex. 8711. I expect that different associations may wish to make presentations to the Bassetts but I leave these details up to each group. I look forward to an enjoyable evening when members of the Montreal Irish community can come together to celebrate, while also acknowledging our appreciation to Ambassador and Patricia Bassett. Rev. 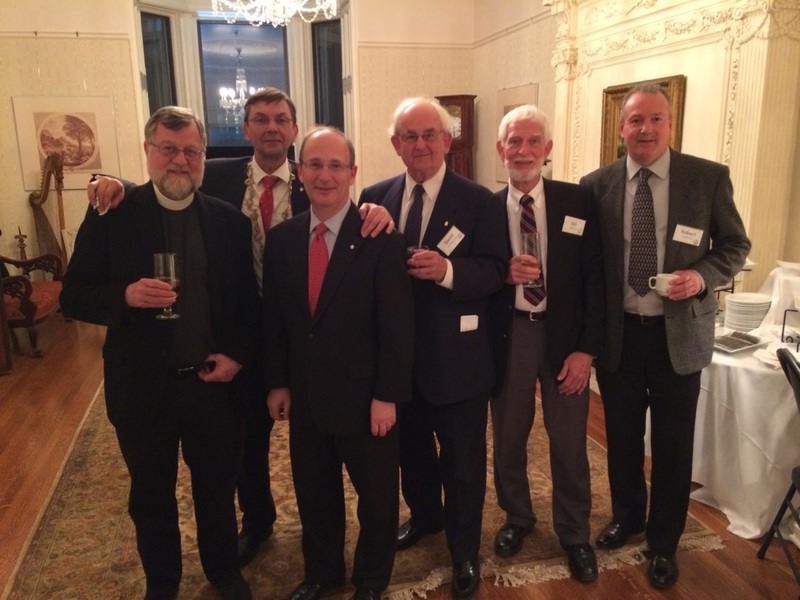 Jim McDermott, Mike Nelson, Michael Goldbloom (Speaker), David Clendenning, Bill Kilfoyle, Robert Ouelette. IPBS Dinner, one of two dinning rooms. Listening to the guest speaker, Michael Goldbloom. IPBS President, Mike Nelson thanking the guest Speaker, Michael Goldbloom, Principal of Bishop's Univeristy. Just to update everyone in the Montreal Irish Community on our efforts to have a beautiful green space built around the area of the Black Rock, here are a few activities that involve the Montreal Irish Monument Park Foundation…..
Also indirectly related, a Mr. Kevin Moynihan from Atlantic Canada will be making a documentary about Black 47 at the same time. Again this year, the Montreal Irish Monument Park Foundation will participate in the AOH annual Walk to the Stone, scheduled for Sunday, May 29th and leaving St. Gabriel’s in the Point after the 10:30am Mass. We have a meeting scheduled with Ports Montreal who currently owns the land where we would like to build the Park. Needless to say, this effort to build a green space around the Black Rock in honour of the event of 1847-8 should be of great interest to everyone in the Montreal Irish Community, and others, - we thank all of the Montreal Irish organizations that have actually supported this effort. 6000+ Irish souls buried at the site of the Black Rock on Bridge Street. Library, 4574 Sherbrooke Street West, Westmount , Quebec H3Z 1G1. and materials for the library. Monument Park Foundation. All are welcome on this very insightful tour. with the Jeanie Johnston Educational Foundation, Parks Canada, and others. never be separated so continued attendance at Grosse Île is paramount. exhibition to the Black Rock. Now being offered on May 28th. Bloomsday Festival celebrates Irish culture and James Joyce's Ulysses - June 12-16, 2016. Thanks to each of you who’ve emailed me back to confirm. If you haven’t yet, read on and reply to this email. ...and read my note below. We have our Gala Closing this Thursday, with the film The Guarantee, and we’re looking forward to seeing our Members there for it – all of you, really! ...all of our regular movie goers. If you’re a Member please put their name on our list, by replying to this email and tell me if you’re coming; if you’re not a Member and planning on coming, let me know too. Many thanks. We need to know so we can get our catering ducks in a row. Note: We will have Colin Murphy, playwright and journalist, and writer of this film, on Skype with us all, following the film. ...and everyone who comes will receive an Irish ‘punt’ as their ticket in! Part of the guarantee of the government!?! P.S. We’ll be screening a short film, “Boreal” by Mandi Morgan', at the start. The Guarantee recreates the drama surrounding the most significant political decision in modern Irish history when the Irish government decided to guarantee the entire domestic banking system. The story charts the origins of that pivotal decision (four years before that fateful night), and follows developments through the peak of the boom to the beginning of the bust. Visit our website, www.cinegaelmontreal.com, to read more about our Gala Closing film and watch a trailer. Admission for non-members will be $25.00 for the film and the Reception following, which will be staged in Concordia"’s EV Building. Ciné Gael Montréal, founded in 1993, is now in its twenty fourth season. Once again we'll be presenting our season's films at Concordia's J.A. DeSève cinema. [see schedule below and at our web site www.cinegaelmontreal.com]. As we start this twenty-fourth season, we must thank the Saint Patrick's Society of Montreal for their sustained strong support over our first twenty-three years. 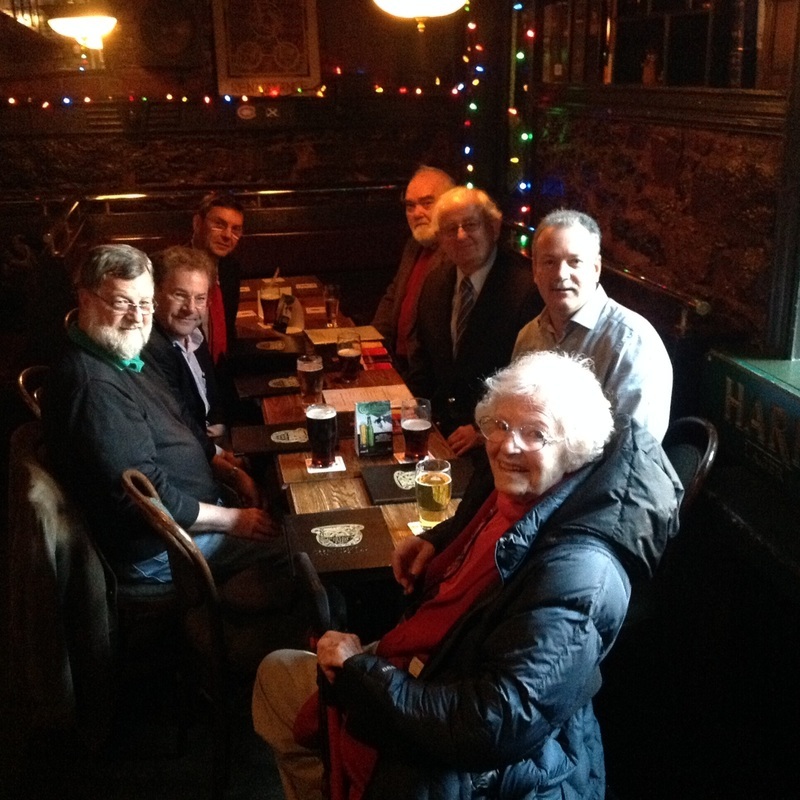 Much thanks is also due to Hurley's Irish Pub who generously host our committee meetings and some of our Membership Evenings, and to McKibbin's Irish Pub who've regularly hosted our Weekend Special gatherings, and we are indebted to the Ambassador and the Embassy of Ireland for their generous support over the years, and to all of you who offer so much enthusiasm. All our sponsors, vital to our success, are listed below. Thanks to all. Our Web site [www.cinegaelmontreal.com] has lots of material for our early years, 1993 to 1997, including our blockbuster 1998 year, and we hope you’ll visit. This represents a real trove of Irish Film history and we have a search feature that lets you to search our site, and gives you links to the Trinity College Dublin and IFTN film archives. ...and we have a few more years to come shortly. Our email list: As is usual each year, some of our members drop off our mail list as they change their email address. To any of you receiving this email, if you have Ciné Gael friends who you know have changed email addresses, ask them if they told us. ...and if you have other friends who should be on our list and aren't, tell them too. Directions below. Thanks. IPBS servers at the old brewery mission: Mike Nelson, Sean Neely, Rob Ouellette, Chad Spannaus. ​On behalf of the thousands of men and women whose lives have been touched by IPBS’ generosity, we want to express our heartfelt thanks to you and your colleagues for your generous donation to sponsor the supper. 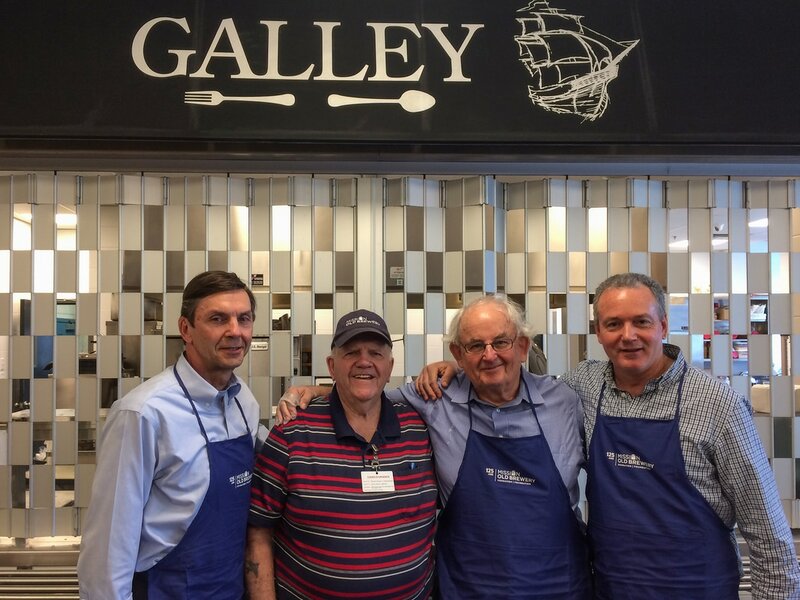 We also thank you for having taken the time out of your busy schedules to help serve a meal at the Old Brewery Mission. 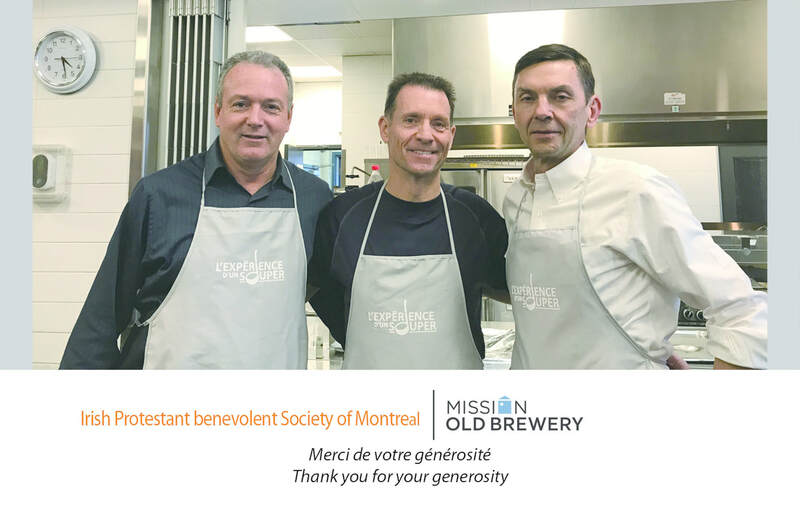 Without the precious support of people like you, it would be impossible for the Old Brewery Mission to continue to help Montreal’s homeless men and women who turn to us in time of need. 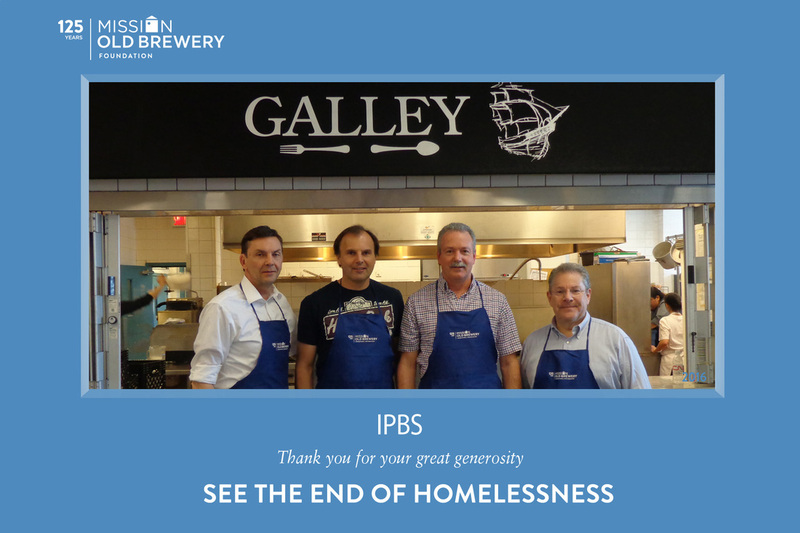 The Old Brewery Mission is grateful to donors who, like you, want to make a difference in people’s lives, not only by soothing homelessness, but also by finding long-term solutions. I hope to have the chance to organize another Supper Experience with you in the future! Exhibition Grey Nuns Centur Theatre, April 11, 2016 at 5 P.M. This is an invitation to see the Word famous Exhibition created by the Grey Nuns at the CENTUR THEATER on APRIL 11th 2016. We know that it is a very late invitation, but these are always the best. The Exhibition just finished at Quinnipiac University , Connicut. It's a Dublin article, but it contains lots of information for the uninitiated and shows the importance of the exhibit. 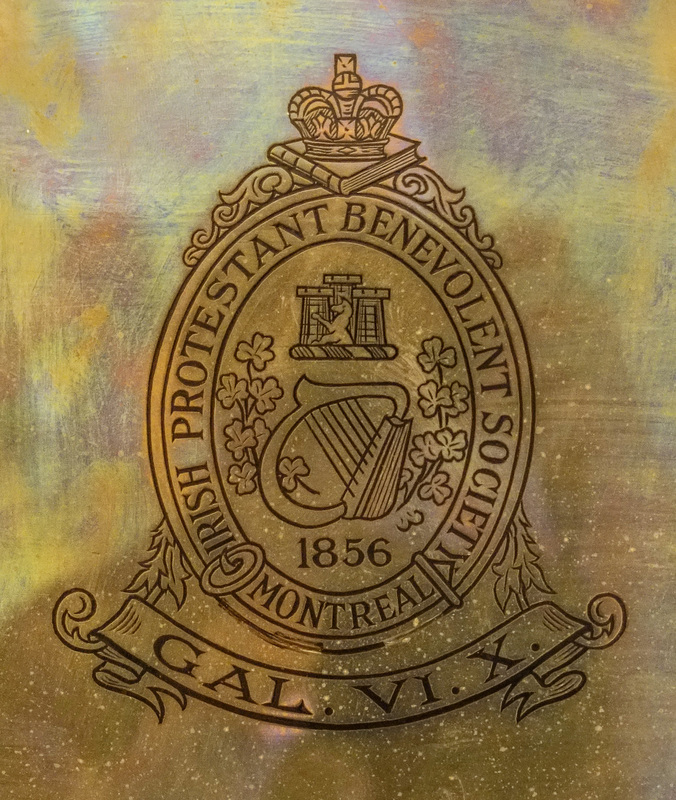 UIS of Montreal - St. Patrick Parade Awards Banquet & Dinner Dance, Saturday, April 2, 2016. ​The IPBS marched with the Ancient Order of Hibernians. St. Patrick's Day, March 20, 2016. IPBS Mike Nelson (left) and Robert Ouelette (right). St. Patrick's Day Annual Luncheon, Thursday, March 17, 2016, 12:00 noon. Bloomsday Brunch at EVOO Restaurant from 11 - 3 p.m.
Penelope Reading with Kathleen Fee, Pub Quiz and Meal at Irish Embassy Pub starting at 5:30 p.m. Academic Sessions at Concordia School of Canadian Irish Studies: 10 - 3 p.m.
Film Night with an introduction and a Q and A to follow - 7:30 - 9:30 p.m.
Storytelling & Song at Atwater Library: 12:30 - 1:30 p.m.
Reading Ulysses with Sylvie Hill: A practical session on how to approach the reading of Ulysses - for beginners or those who've given up in the past. At the McGill Community for Lifelong Learning 7:30 - 9:30 p.m.
Lecture on Beckett/Joyce by André Furlani at Concordia: 11:00 - 12:30 p.m.
Finnegans Wake: Open Group Reading and discussion at Westmount Library from 7 - 9 p.m.
June 16 - Thursday: BLOOMSDAY! Readings from Ulysses at Westmount Library 11 - 3 p.m.
Bloomsday Closing Lecture Abby Bender of NYU will talk about her new book: Israelites in Erin: Exodus, Revolution, and the Irish Revival at the Jewish Public Library 7:30 - 9 p.m.
Bloomsday 2016 Closing Reception at the Jewish Public Library 9 -10 p.m. In addition: There will be a Pub of the Day Monday to Thursday. IRISHMAN OF THE YEAR BREAKFAST, SATURDAY, MARCH 12 AT 9 AM. IPBS Members are encouraged to attend this event. INFO: In April 1998, Catholic Nationalists and Protestant Unionists in Northern Ireland signed a historic peace agreement, The Good Friday Agreement. This talk examines how the news of this peace agreement was received in Israel, which was dealing with its own issues of peace agreements and peace processes. Israeli press coverage of peace in Northern Ireland ranged from the jealous to the congratulatory, from a dovish desire to find lessons for Israel/Palestine in the example of Northern Ireland to a hawkish refusal to make the comparison. Shared vocabularies of violence, religiosity and supposedly ancient conflicts also made regular appearances. In other words, Israelis discussed the events in distant Northern Ireland in terms of their own local realities and thus highlighted the tensions and fractures of Israeli self-perceptions in the years after the Oslo Accords and before the Second Intifada. About the speaker: Aidan Beatty completed his PhD in history at the University of Chicago in 2015. 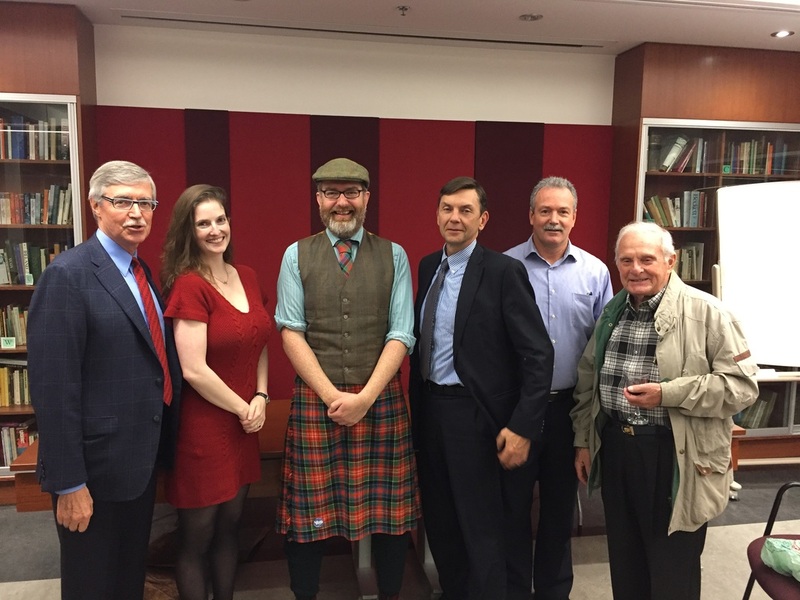 He is currently a Post-Doctoral Research Fellow at the Azrieli Institute of Israel Studies and is also a Scholar-in-Residence at the School of Canadian Irish Studies. His first book, a comparative study of masculinity in Zionism and Irish nationalism, will be published in 2016 by Palgrave Macmillan. WHAT: 1916 Centenary Commemorative Conference includes a reception, commemorative lectures and commemorative service. The conference will be in Irish with simultaneous translation. This conference is a Celebration of the Irish Republic, the Irish Language, and the Irish Canadian Identity. 2016 marks the 100th year since the declaration of an Irish Republic in 1916. The Uprising, of which the Declaration was a part, had enormous implications in Ireland, Canada, and worldwide. In Canada, it made public an Irish Canadian identity which supported political independence for the ancestral homeland; the Self Determination for Ireland League of Canada boasted a membership of 300,000. It also represented the high-water mark for the Orange Order in Canada, which numbered 200,000 at the time. The Opening Cine Gael Winter 2016 Social Event will take place on Friday, January 22, 2016 at Concordia University, DeSeve Theatre, 1400 de Maisonneuve West, Montreal. The opening night movie "Noble" will be at 19:15 followed by a post movie cocktail reception at 21:00. The film is based on the true story of Christina Noble who grew up homeless in Ireland in the fifties and went on to be an advocate for homeless in Viet Nam. It is a beautiful and moving film. Membership for the season is $70, or the opening night movie plus reception at the Concordia Faculty Club will be $20. IPBS members are encouraged to attend the opening night. When: Monday, December 21 at 5:30 p.m.
An opportunity to extend Christmas greetings to your fellow members of the Irish community. Happy hour prices and complimentary finger foods. The IPBS is promoting the BROOKLYN movie release, an Irish-Quebec co-production. The movie of John Crowley starring Saoirse Ronan and Domhnall Gleeson will be release in Montreal theatres starting December 18. BROOKLYN Synopsis : This is a superb combination of romance and coming-of-age story. The coming of age occurs when Eilis (a luminous Saoirse Ronan) leaves her Irish homeland in hopes of a better future in the U.S.A. (This is 1952, so homesickness can't be cured via Skype.). The romance happens on both sides of the Atlantic, when Eilis has to leave her American beau behind to travel back home, where a charming Irish lad pitches woo. Unusually for a romantic drama, both suitors are good prospects; there is no villain in this movie. There is no fatal flaw to be found in either man; Eilis must simply do the mature thing, and choose one man -- and one life -- over the other. 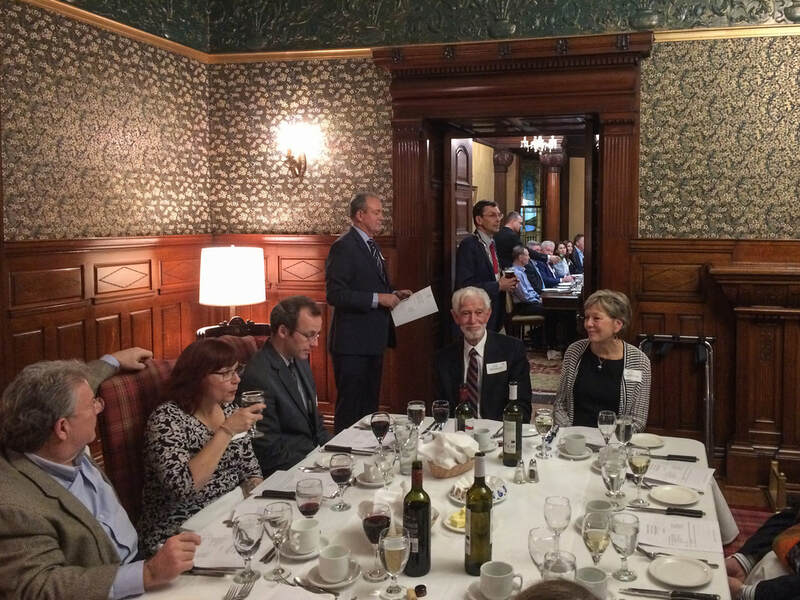 The IPBS Christmas Lunch will be held for members on December 11, 2015 at Herley's Irish Pub. Reservation is under the name of Mike Nelson, President of the IPBS. We look forward to seeing everyone again on the festive occasion. IPBS members are encouraged to sign up to receive the free Weekly e-Newsletter from the Irish Studies at Concordia. Ten years ago, St. Patrick’s Society President Dr. John Little made the proposal that resulted in the establishment of a prestigious annual lecture that would bring high profile speakers from Ireland to speak to the Society and members of the wider community. The idea was that the funding provided by St. Patrick’s Society would allow us to invite very distinguished individuals to speak at Concordia. Among those who have come to Montreal under the auspices of the St. Patrick’s Society Lecture Series are former Prime Minister Dr. Garret FitzGerald, Director of the Abbey Theatre Fiach Mac Congail, Chef Darina Allen, Writer and Journalist Fintan O’Toole, and Caitriona Crowe of the Irish National Archives. To mark the tenth anniversary of this prestigious lecture series the speaker will be Vincent Woods, one of Ireland most well-known cultural figures. All Irish Protestant Benevolent Societymembers and their friends are invited to the special anniversary lecture, as well as to a special reception beforehand in the McEntee Reading Room at 6.00pm. I look forward to welcoming you to Concordia for this special lecture, on Thursday, November 12. Ireland-Canada Chamber of Commerce (ICCC) is delighted to announce that Ambassador Vickers, Canada’s Ambassador to Ireland, will be ICCC Montreal's guest. Kevin Vickers was formerly the Sergeant-at-Arms in Canada’s House of Commons. 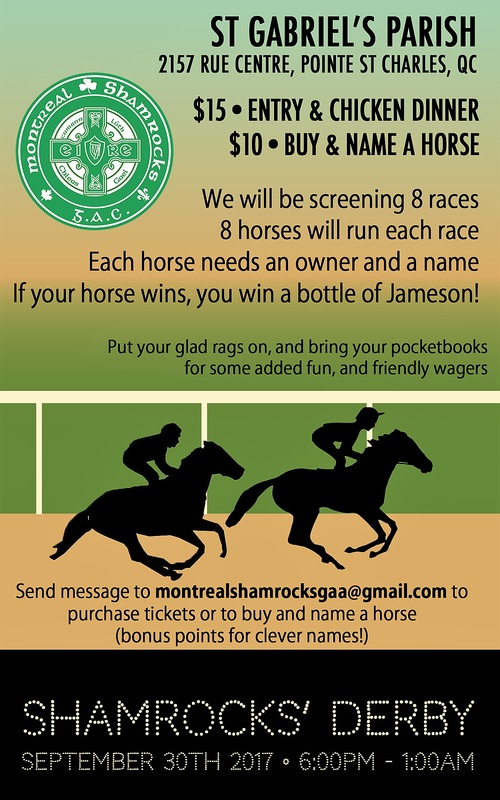 When: Friday, November 6, 5:30 to 8:00 p.m.
All members of the Montreal Irish community are invited. Bill Hurley has promised a special Hurley’s welcome. The Concordia Irish Society is welcoming abstract submissions for the Irish Studies and Celtic Studies joint conference to be held January 22-24, 2016 at Concordia University. Original and interdisciplinary works are encouraged which discuss various areas of Irish and Celtic Studies, such as history, language, folklore, literature, landscape, music. Abstracts should be 250 to 500 words in length, and will be accepted both in English and in French. Please note that presentations must be no longer than 20 minutes. As such, the suggested final length of all papers should be between 10 and 15 pages. Please keep this in mind when submitting your abstract. Please forward them to the following e-mail address cis.submissions@outlook.com. The subject line should be [Your Name] - Irish and Celtic Studies Conference Abstract. Also, please provide in the email, your field of study, University, and contact information. A registration fee of 15$ applies to all who would wish to present and attend the conference. Presenters will only be asked to pay this fee once their paper is accepted, and their attendance has been confirmed. You can, of course, register to attend the conference without presenting. General registration will be open on Monday, October 5, and will close on Friday, December 18. The deadline for abstract submissions is Monday, November 30. 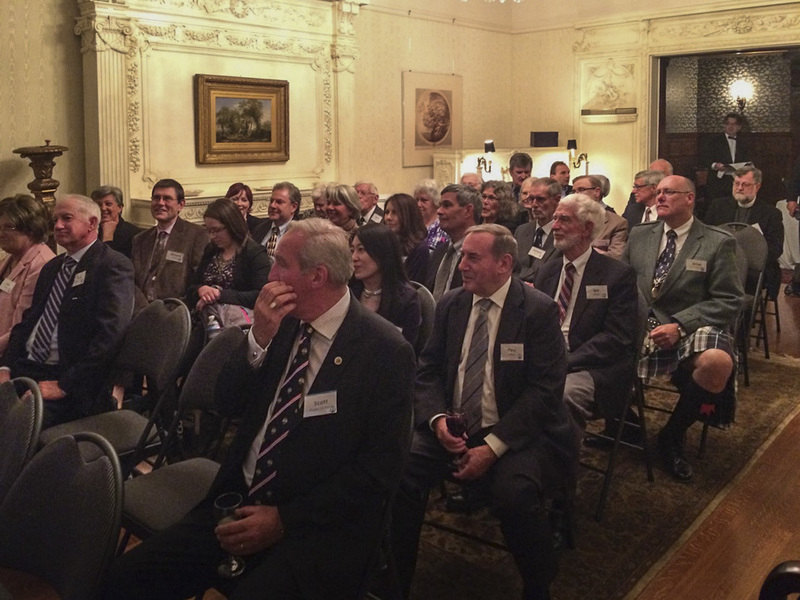 Thursday, October 14, 2015 at 7 p.m.
On October 16, Jim MacPherson repeated his lecture at the residence of the Irish Ambassador in Ottawa. David Clendenning, IPBS Council member, attended. 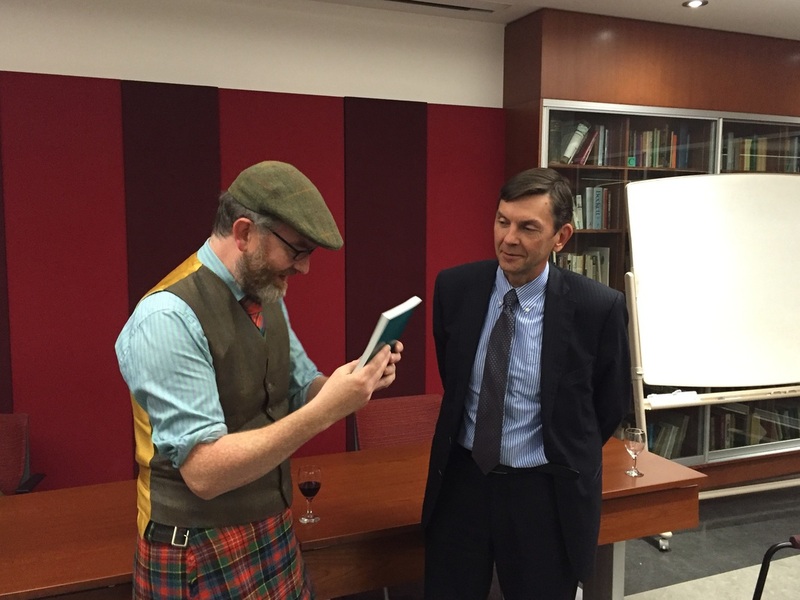 A sing along to "Scotland the Brave"
Mike Nelson, President IPBS presenting the book, "The Irish Way" to Jim MacPherson. "Irish Protestant Benevolent Society Book" Prize Winner for 2015", Cole Bricker. Cole was extremely pleased to learn that he had been awarded this prize and appreciated this honour. "Cole Bricker is a fourth year honours history student at McGill University. Cole specializes in European history, with a particular interest in the affairs of the British Empire. Cole has been an editor for McGill's undergraduate history journal, Historical Discourses, and is actively involved in the McGill Debating Union, currently holding the position of Chair of Debates. 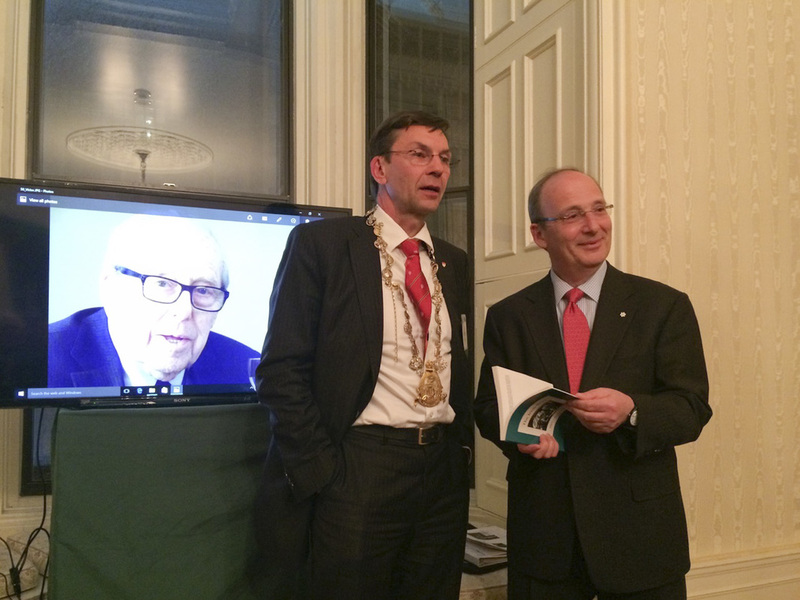 Cole is incredibly honoured and grateful to receive the Irish Protestant Benevolent Society Book Prize." The recipient of the 2014 prize, Benjamin Gordon, entered McGill's M.A. program in history in the Fall of 2013.